Prince Andrew Tendo, a top Royal member of the defunct Ankole kingdom has been grilled for grabbing 3 square miles of land in Kyankwanzi district. Tendo testified before the commission of inquiry into land matters that his father Reverend Sam Muchokoleza of Rusherere, Kiruhura district was among the last respected royals in Ankole before abolished. As he was bragging, the Commission’s deputy lead Counsel John Bosco Suuza asked him to show documentary evidence that he legally owns the 3 square miles of land on Ssingo block 812 plot 25 which cover three villages of Mbogobiiri, Kasambya and Bugondi in Kyankwazi district. Instead of answering the questions, Tendo tasked his cousin brother, a one Sunday Kayitambogo to answer for him the questions because he is his manager and has the right anwers on the issue. He was advised by Suuza that since he is the one who swore as a witness and took to the witness stand, he was the one to answer the questions not Kayitambogo. When he realized that he was cornered, he gave an excuse that he spent much of his time in exile in Kenya after surviving being arrested by Milton Obote government in 1981. He said that he was the chief solicitor of guns and other war logistics to facilitates the NRA war struggle in 1980’s, he further revealed to the commission his legacy in struggles and he bragged that he liberated Uganda from dictatorial regimes since he was a powerful fighter in FRONASA. He further asked the commission to allow him read for them his written statement on the claims put to him that he has been using president Yoweri Museveni’s name and UPDF soldier’s to grab land Kyankwanzi. At this time justice Bamugemereire intervened and ordered Tendo to follow the commission’s orders by answering all questions asked by the lead counsel. He testified that when he came back to Uganda in 1986, he went to the Uganda land Commission and asked them to get for him a big piece of land where he can establish his maize milling factory. He said that he was advised to look for the land and in 1987, his two friends George William Lubega and Sekitoleko tipped him that there was vacant land along River Mbongo in Kyankwanzi. He said that he got Andrew Kityo, a surveyor who inspected the land and by then, though it was a forest, it was very fertile for growing maize on a large scale. He said that he went back to the Uganda land commission and applied for four square miles of land but Kiboga district land board only approved 2 square miles which he protested. He testified that the lands minister by then ordered Kiboga district land board to give him four square miles because he was looking for a big chunk of land for his business. He said that Kiboga district land board only approved 3 square miles and he and accepted to take that. He said that in 1992, he was awarded a lease of five years from Uganda lands commission with strict conditions of developing the land by that period. He said that when his lease expired in 1997, he went back to Uganda land Commission and asked for a bigger period of 45 years . He further testified that he wanted to mortgage the land in the bank so that he can get money to start his dream business since he did not have money to start. He said that all the banks he went for a loan asked him for a land title with a bigger lease period because he wanted a lot of money. He said that the commission refused to extend his lease from that period until 2010. Bamugemereire asked Tendo to show documentary evidence that he asked for an extension of his lease. He started checking in his file as he pleaded that the Commission should first give him documents which he gave to them. Bamugemereire then told him that he was not prepared and ordered him to come back on Wednesday when he is prepared. 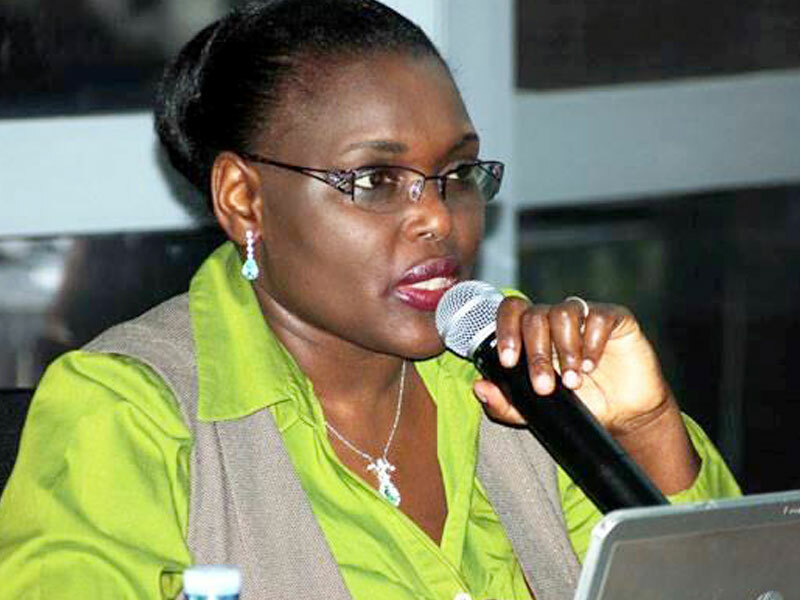 A witness testified that Tendo is being used by lands senior minister Betty Amongi to write letters ordering security organs to provide security to Tendo to open boundaries on the disputed land which has locals already settled on it. He said that in Amongi’s letter, she told residents to cooperate properly with Tendo and see how they can stay together on the land. During the forceful opening of boundaries, people were shot, teargassed and brutally arrested. 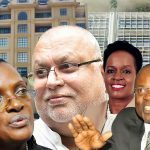 Amongi was accused that she first wrote to security agents telling them not to allow any body to open boundaries until the ministry had finalized with its investigations and discovered the true owner of the land. The witness alleges that Amongi quickly changed her first letter after meeting Tendo. The commission is still investigating the matter.